Designed for user who need low temperature vapour storage, easy maintenance and low liquid nitrogen consumption. The offset neck and rotating tray design provides access to all stored products. Efficient thermal design ensures 95% of system surface area enclosed by vacuum while maintaining the lowest sample temperature in the industry.(-190°C). Lowest liquid usage typically 40% below equivalent standard ranks of similar capacity. Liquid reservoir below sample platform will typically maintain temperature for more than 20 days in vapour use. 2ml cryotubes storage capacities of 15,600, 35,100 and 79,950 for 810, 1520 and 1830 Eterne respectively. Battery backup option and gas bypass options are always recommended. 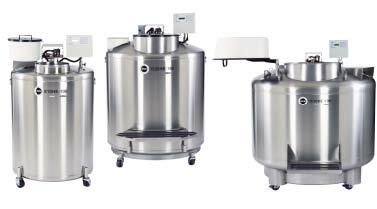 Inventory systems for cryotubes of different capacities and blood bags and customised racking systems are available. Contact us for more details.